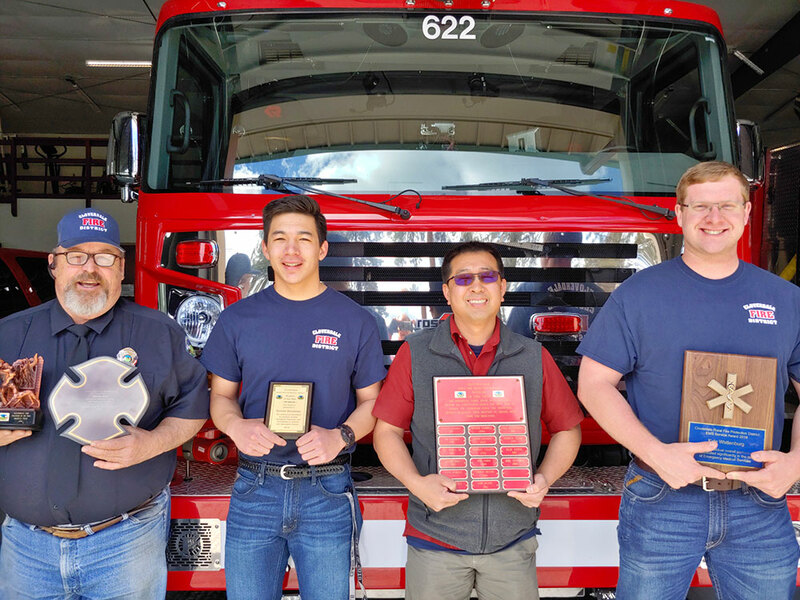 The volunteer members of the Cloverdale Rural Fire Protection District are a dedicated group of individuals who are true volunteers. They receive no monetary reimbursement for their time and service to the constituents of the District. The District does cover all the cost of their training, personal protective equipment and all related costs of their accreditation as firefighters and EMS first responders. On Sunday, March 17, the Cloverdale RFPD held its annual awards banquet for recognition of the District’s volunteer members — and noted that numbers of those volunteers are dwindling. As Fire Chief Thad Olsen conveyed in his State of the District speech, the pool of volunteers in the District has been slowly eroding. While many members have been with the district for over 10 years, recruitment of new volunteers has been a challenge. Cloverdale RFPD is looking to bolster its ranks. New volunteers will serve alongside some stalwart members of the District. Joel Stutzman was awarded Rookie of the Year. In his first year, Joel stepped up as the Cloverdale Volunteer Fire Fighters Association president. Stutzman has been instrumental in support of members as he is also an associate chaplain for the Central Oregon Public Safety Chaplaincy, responding to emergency requests for a chaplain to scenes throughout the county. Kyle Wattenburg received the EMS of the Year award for responses on medical calls throughout the district. This is the second year in a row Wattenburg has received this award. Kyle joined the department as a volunteer after attending the first year of the Sisters High School Fire-EMS program created and supported by Heather Johnson, health teacher at Sisters High School, Sisters-Camp Sherman Fire as well as Cloverdale Fire. The program is heading into its sixth year this coming fall. Last spring Cloverdale Fire joined the county-wide COCC Joint Recruitment for Fire Science students. This program brings students into the firehouse as live-in residents. The District supports the students’ educational funding, and in return we have live-in volunteers who get to learn and respond with seasoned fire service personnel. Cloverdale Fire picked up their first three students last year. Turner Stutzman, a 2018 graduate of Sisters High School, was selected as Student of the Year for his exemplary academic performance and his overall positive impact with the department through emergency responses, training, and event participation. Marcus Peck received two awards. Peck was selected by his peers as the Volunteer of the Year. Even though Marcus is always busy between his work, his involvement with the Sisters Rodeo Association, and other community involvement, he always makes time to respond to calls. Peck also makes himself available to assist the District whenever he can. “Whether it is plowing snow at the stations, moving cars for extrication trainings, he is always here to help,” said Captain Michael Valoppi. Peck also was awarded the Deputy Chief John Thomas award. Deputy Chief Thomas was an integral member of the District for over 20 years, and now serves as the secretary of the Cloverdale Fire Board of Directors. This award is selected by the fire chief for dedication, service, and emergency responses for the District. Cloverdale Rural Fire Protection District is a small combination department. The District employs only two full-time staff —the fire chief and a training officer. “All other firefighters you see showing up at fires like the Rabbit Brush Fire along Highway 20 in August are our volunteers,” Valoppi said. “We are looking to you, our neighbors, for fresh faces to join us. All training is paid for and your support of the District will be instrumental in keeping those who live beside you safer. For more information contact Cloverdale Rural Fire Protection District at 541-389-2345 or visit www.cloverdalefire.com.